While I don’t usually take the time to pump my own gas with this blog I wanted to share the complete reversal in our deliverables over the last year. It used to be, way back at the end of 2008 that we delivered most of our building surveys in 2D AutoCAD format, now we would build in 3D, normally in ADT but our clients wanted 2D AutoCAD. From a surveying perspective a 3D object oriented universe worked better for us because essentially all the views were coordinated, that is build it in the floorplan directly, it is represented in elevation correctly. Anyone who has keyed up a plan in 2D knows where I am coming from, which if you are here reading this, means you know what I am talking about. 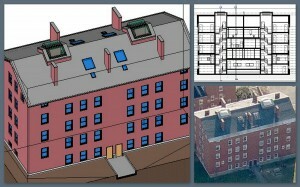 Now, however, the bulk of what we do is deliver as-builts in Revit. The GSA requiring BIM has a lot to do with it, I believe, and Autodesk being the biggest player in the US means Revit becomes the default. Whether you like that or not does not matter, that’s the reality. Recently we have performed as built surveys at Phillips Exeter and Emmanuel College and we were field testing our laser to BIM technology, PKNail. It was created to capture typical conditions quickly and accurately. If you wanted to capture the Capitol Dome, I would suggest laser scanning, for capturing most situations Point to Point Laser Scanning (PPLT) should work just fine. PKNail converts measurements directly into a Revit workstation-wirelessly, measure a wall that wall is entered into Revit, encounter a door, window, Fire Extinguisher Cabinet, sink, if you can measure it, it can be placed quickly and easily into the model. Lastly, if the deliverable is 2D CAD, exporting views from Revit to AutoCAD sheets is a snap. Here’s a long winded Autodesk treatise on the subject or well, it looks like I will need to update with a screen capture video the quick process but the resulting CAD contains some of the meta information collected in 3D, such as 30″ Door, rather than creating anonymous objects. Next post will follow in short order with a sneak peak of some of the features and the connectivity between Revit and a Leica Disto enabled by PointKnown surveying software. Thanks for tolerating some self promotion. Speaking to a colleague from Europe who moved to the US because he stated, ‘there’s a survey shop on every corner in the UK, I could only find a handful here.’ However, that’s changing. HDLS, high definition laser scanning is starting to take off, especially now that the GSA issued the laser scanning awards. Additionally, more and more people are reworking existing assets / adaptive reuse projects so it is becoming more and more important to get the existing conditions data. While everyone is waiting for the day we can walk around with a magic wand and wave it around the room we have to build a bridge from here to there. HDLS in creating a 3D database is an excellent start. I believe HDLS, from firms like Leica and FARO, performs fantastically in certain circumstances such as inaccessible or difficult geometry, exposed MEP intensive projects, however, for typical conditions especially the interior of buildings it might be akin to using a sledgehammer rather when you need a fly swatter. We, PointKnown, have been developing a product that bolts on to Revit and takes laser range finder data and builds objects as you measure. This has been defined as PPLT (Point to Point Laser Technology). It allows a surveyor to move quickly and accurately from room to room or object to object. We do not intend for it to usurp laser scanning but rather augment current surveying teams, allowing them the most flexibility depending on the situation. Most importantly is to define the deliverable and type of model needed for the project. This can start at the basic architectural model using generic library items to, well , anything goes but most of our clients want dimensionally correct space and then they apply the material and details they need as that is what they want to control. We are now accepting people and firms into our public beta that starts January 2010, if you have any interest please feel free to contact us at info@pointknown.com and put beta in the subject line. PointKnown website www.pointknown.com has its splash page up and expects to be in beta within the next 6 weeks. 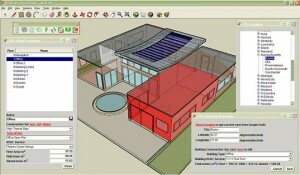 PointKnown has developed a system that takes laser range finder data and builds Revit models in the field. Point to Point Laser Technology (PPLT) increases the capture of existing conditions, speeds the production of BIM and Revit Models of the built environment and decreases data gathering and draft time by over 50%.